Slap bass is an essential technique on bass, and in this video lesson, I will show you how to accurately perform the slap technique. For more information and exercises to play in this style be sure to check out our new book Bass Technique Finger Gym. 1. Relax your hand and curve your fingers towards your palm. Keep your fist relaxed and make sure your thumb doesn’t touch your fingers and your fingers don’t touch your palm. 2. Keeping your thumb straight, align your hand shape so that your thumb runs parallel to the strings of your bass. Achieve this by moving your arm position, not moving your hand from the wrist. Your thumb should be just above the very end of the fretboard. 3. Strike the string with the outside edge of the knuckle of your thumb against the frets. The aim is to rotate your hand down to strike “down and through” the string. In example 1 slap the open E string in 1/4 notes. The small “t” above each note indicates the use of the thumb slap on the picking hand. Listen to the audio tracks before playing them yourself. Now play four 1/4 note slaps on the open E string and four 1/4 note slaps on the open A string. When you have mastered open string slaps you can move onto fretted note slaps. Play the 5th fret of the E string to create the note of A and slap that four times using 1/4 notes. Example 4 demonstrates four 1/4 note slaps per bar, but moves through different frets and strings. It may be challenging to move between strings using slapped notes at first, so start off slowly with a metronome at around 50bpm before gradually raising the tempo. Adding muted notes to slaps is an essential bass technique and is used extensively in funk. Slap the open E string on beats 1 and 3, but when you play beats 2 and 4, release the pressure of the fretting hand (while maintaining contact with the string) to create the muted note and slap the note in the same way. Refer to the muting exercises shown earlier in the chapter if this feels difficult. Repeat the same exercise on the open A string. 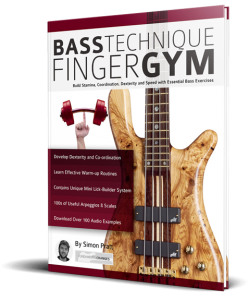 For more examples of slap bass, and how to play pop sounds make sure you check out the brand-new book Bass Technique Finger Gym. A special thanks to Danny Cross for filming the video.